The Congressional Budget Office (CBO) released their analysis of the American Health Care Act (AHCA). The AHCA is the bill that passed the House that is a combination repeal of significant elements of the Affordable Care Act, partial replacement of some of the health care provisions, and a major tax cut. The CBO scored a draft of the bill in March before it was pulled from the House floor. They did not have the opportunity to score the amended bill that passed the House. The MacArthur/Upton waivers were the amendments that significantly changed the bill. These waivers allow states to fully opt out of the insurance regulations of the ACA and allow for full underwriting of health premiums. The CBO believes that these incentives will split the pool and make it virtually impossible for individuals with expensive illnesses to be able to afford the premium. The AHCA is a policy choice that will, in some states, effectively restore the 2009 status quo in the individual insurance markets even if there is language that prohibits denial of offering a plan due to health status. It will not contain any ability to make that offered plan affordable. It is a de facto underfunded high cost risk pool instead of a de jure denial of coverage. And if a state elects to operate a waiver in an environment where insurers can choose the state of regulation, that state will effectively gut community issue across the country. But.. but… but… what about networks? That is a common argument as to why selling across state lines would not be attractive. In the current world of guarantee issue and community rating, this is a strong defense. Networks are tough to assemble and expensive to build. We know there is a chicken or an egg problem. Large membership is needed to get good provider rates. Good provider payment levels are needed to offer attractive premiums that leads to large membership numbers. A new insurer trying to move into a new state has to build a network. And it has to build a network by either going super skinny or by being willing to lose significant money for several years to buy membership. But that is under guarantee issue/community rating rules. Networks are not a blocking force for cream skimming carriers. If an insurer wants to expand out of its home region in Rep. Jordan’s vision, they can either build a network organically or they can rent a network. Rental networks are very common. They are how regional carriers offer national emergency room coverage. They are how smaller carriers offer very high end specialty care. The provider are paid at a very high level. Some rental network contracts are full usual and customary, others are full billed charges, some offer a discount on one of those two benchmarks and others are 500% of Medicare. These are expensive networks where regional carriers work very hard to minimize the number of claims paid to that network. If a minimally viable network can be rented even at an extremely high per unit rate, and the plan can medically underwrite to only offer coverage to people who will never use the skimpy, practically inadequate, high cost network, this works as a business model. If an individual has a complex medical condition during the contract year, the insurer has significant claims expense but since the network is extremely unattractive to individuals with complex care needs, the one time catastrophic expense will leave the plan at the next open enrollment if they can afford to do so or if they are in a policy that does not have guarantee renewability. This is effectively the Assurant business model from the pre-ACA status quo. They aggressively underwrote policies to only include healthy people, they offered very low rates and access to a very expensive to them network and seldom payed a claim as their covered population just did not use services. Networks are not a barrier to entry for carriers that think they can aggressively underwrite. Let’s imagine a hypothetical high cost risk pool of the top 1,000 individual claim years in the country. The average claim will be $5,000,000 for the year. Let’s simplify things and say 990 are randomly distributed by population and 10 are a non-random cluster that we can insert into any state at any time. The first run through is with fifty one state (and DC) based high cost risk pools. We’ll look at two states, California and Wyoming, for this run. California has about 10% of the population. California should expect to see 99 people in this hypothetical pool plus an expectation that one of the ten non-random people would be expected to be in California. Their expected high cost risk pool budget is $500 million. Now if all ten of the non-randomly clustered people are in California, they increase the expected pool costs by 9%. California is big enough and rich enough that a surprise $45 million dollar medical expense does not destroy their budget. Now Wyoming should expect to see between 1 and 2 people qualify for the high cost risk pool. Let’s assume the Wyoming state government is very cautious and they allocate $10 million for the high cost risk pool. That works great in a normal year. But if the travelling roadshow of catastrophic medical expenses arrive in Cheyenne, the state is now on the hook for twelve qualified individuals. They are 500% over budget now and the state budget is underwater. This thought experiment is amazingly unrealistic. Even if we are to assume that extreme medical cost cases are randomly distributed, we should expect several states to be surprised at the number and expense that they face as Pennylsvania could reasonably expect to see anywhere from 45 to 51 qualifying individuals from the scenario above in any given year just do to random chance. More importantly, we know that diseases are not randomly distributed. My ongoing freak-out about Zika is based on the fact that this is a concentration of very high need and high cost individuals on states with low Medicaid funding. Genetic disorders are tightly clustered due to both the combination of most people live near their families rather than being randomly distributed and localized clusters of diseases have led to local medical-industrial clusters of medical knowledge and treatment. For instance, maple syrup urine disease is a common genetic disorder among Amish families, so there is a good deal of knowledge on treating that disease clustered in Lancaster County, Pennyslvania and Holmes County, Ohio. Sickle cell disorders are overwhelmingly a disease of African Americans, so it is more common in Mississippi than Montana. From a financial perspective, there is a chance that there is enough sample size that although one state will have more of one genetic disorder it washes out as another disorder it is light in is dis-proportionally prevalent in another state so the cash flows balance out. That is an empirical question that I don’t know enough to answer. But even if genetic disorders balance out, localized outbreaks like Zika won’t balance out. State based high cost risk pools would remove some of the falling knife incentives that I described in Iowa but they will be underfunded and overwhelmed at times of high need. National level pooling is far more efficient and effective. The House Rules Committee introduced a new amendment to the AHCA this morning. What does it do and does it matter? SEC. 2205. FEDERAL INVISIBLE RISK SHARING PROGRAM. (a) IN GENERAL.—There is established within the Patient and State Stability Fund a Federal Invisible Risk Sharing Program (in this section referred to as the ‘Program’), to be administered by the Secretary of Health and Human Services, acting through the Administrator of the Centers for Medicare & Medicaid Services (in this section referred to as the ‘Administrator’), to provide payments to health insurance issuers with respect to claims for eligible individuals for the purpose of lowering premiums for health insurance coverage offered in the individual market. (1) APPROPRIATION.—For the purpose of providing funding for the Program there is appropriated, out of any money in the Treasury not other- wise appropriated $15,000,000,000 for the period beginning on January 1, 2018, and ending with December 31, 2026. These two paragraphs are the meat of the four page amendment. So what does it do. First it renames reinsurance to “Invisible Risk Sharing Program.” Secondly, it authorizes HHS/CMS to inject $15 billion dollars of non-premium dollars into the claims payment of the individual market over nine years. Renaming reinsurance to Invisible Risk Sharing Program is a nothingburger. The key is the injection of money from outside of the premium pool into claims payment. Assuming that HHS elects to use this money as if it is reinsurance, that means HHS will use general revenue to pay some portion of very high cost claims. Since the money is coming from outside of the premium pool, it will lower the premiums paid as the premiums no longer to have to cover full claims expenses. So we get a rebranding of a basic insurance concept and a 2% reduction in premiums. Not much of any real substance actually is happening in this amendment. Molina Insurance, a fairly successful Exchange carrier that has usually been profitable on and off Exchange, issued a statement yesterday afternoon concerning the House Repeal bill. The statement is ugly and it illustrates a very important point of the Republican bill. It will create an on-Exchange death spiral in many counties. So what is the model that leads Molina to believe the Exchanges would see mass disenrollment and high price hikes under the Republican plan? It is a combination of the flat age based subsidies and the late enrollment penalty being a proportion of premiums. Some markets and counties would not be affected. 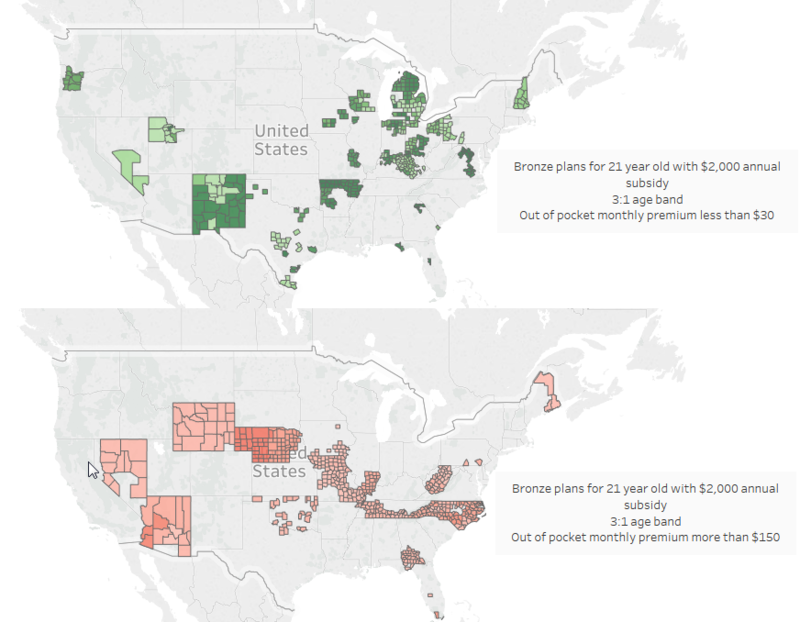 Portions of Texas and Pennsylvania for instance would see 21 year olds be able to buy Bronze plans at zero cost. Those counties should have healthy risk pools. But risk pools are not county specific. They are state specific single pools. High cost counties will have a very different dynamic. High cost counties with a flat age based credit will see young people face significant out of pocket monthly premium expenses if they maintain continual enrollment. A 21 year old is highly unlikely to need much care over the course of a year so most healthy 21 year olds will leave the market. They pay no penalty at the time of their decision to leave the market. And they will make the same decision the following year assuming no new information about their health status arises. Now a 22 year old can jump into the market with a 30% penalty which they will only pay if they know that they are going to be expensive in the following year. The ACA Exchanges average about 34% enrollment under age 35. This system will dramatically reduce enrollment as a number and as a percentage of enrolled for Under 35. The composition of the young enrollment will also be significantly sicker in high premium counties. On the other hand, moderately expensive but still profitable 60 year olds know that their uncertainty zone for future costs are higher. They could have a year that looks a lot like the current year or they could have a catastrophic year. The odds of a catastrophic year are much higher for a 60 year old than a 21 year old. Further more the penalty for being unenrolled and then enrolling in the future period is much larger. For somewhat expensive but profitable members, the 30% penalty is much more stringent than the current $650 or 2.5% of income penalty. At the same time, the really healthy members who have low utilization at age 60 will drop coverage as the relative costs of the 30% one time late enrollment penalty is less than the cost of premiums for the current year. Very low cost enrollees will flee unless there is a minimal cost plan out there. The risk pools will become very old and very sick very quickly. That is how Molina is modeling their future. North Carolina is a high cost state for health insurance. Under the Affordable Care Act, people who receive subsidies on Healthcare.gov are shielded from price increases because the subsidy is tied to the cost of the second least expensive Silver plan on Exchange and the individual pays a fixed amount dependent on their income. The personal contribution amount is fixed based on the person’s income defined by the Federal Poverty Level. That means a 21 year old who is subsidized will pay the same post-subsidy premium to the insurer as a 64 year old with the same income. The American Health Care Act (AHCA) bill that was released on Monday night changes the subsidy formula. Subsidies are no longer tied to the cost of insurance or the individual’s income. Instead any qualified individual who makes less than $75,000 per year receives a fixed subsidy amount determined by age. A 21 year old receives a $2,000 subsidy. A 64 year old receives a $4,000 subsidy. In the ACA premiums are allowed to be three times higher for a 64 year old compared to a 21 year old. In the proposed AHCA, premiums are allowed to be five times as high for a 64 year old than for a 21 year old. Since the subsidy grows far slower than the premium, this means the 64 year old, for a given deductible, will pay far more for their coverage. I’ve used the 2017 Exchange data to see how much a 60 year old in each county in North Carolina would have to pay after their subsidy every month to buy the least expensive Bronze plan currently offered. Bronze plans tend to have deductibles of at least $6,500 with out of pocket maximums of $7,150. The circles are larger for counties with more enrollment as of 1/31/17. 60 year old residents in Nash County are the best off. They would only pay $439 per month after the newly revised subsidy is applied. Currently, someone earning $20,000 a year in Nash County would pay nothing for the least expensive Bronze plan and only $31 a month for a low deductible Silver plan. 60 year old residents in Bladen, Cumberland, Harnett, Hoke, Richmond, Robeson and Scotland counties are the worst off by this change. They would pay $754 for a Bronze plan under the AHCA fixed age based subsidies. Under the ACA, someone earning $20,000 a year would pay the same as a Nash county resident. Someone who is age 60 and earning $40,000 a year would pay $110 a month for a Bronze plan and $283 per month for a Silver plan under the current ACA income and plan cost based subsidies. High cost states with a large number of older residents will be significantly worse off under fixed age based subsidies. One of the major proposals in the draft Center for Medicare and Medicaid Services (CMS) rule that was released on the 15th is to increase the de minimas allowed actuarial value band. Currently the regulation allows a plan to be included in a metal band if it is within two Actuarial Value (AV) points of the target band for normal bands, and within a point in either direction for the targeted Cost Sharing Reduction Silver plans. So that means a standard Silver plan which should be a 70% AV could be anywhere from 68% AV to 72% AV. The proposed modification would allow for a plan to qualify for a band if it was no more than four points below or two points above the target. A Silver plan would be anywhere from 66% AV to 72% AV. All else being equal, a lower AV means a slightly lower premium. It also means higher out of pocket spending for patients. But all else is seldom equal so things can get messy. This has significant distributional consequences. And these consequences are not entirely straightforward as the individual market is a complex market. Let’s start looking at the easiest scenarios and then build in complexity. We will need to divide the analytical units into four groups. The vertical split of a 2×2 grid are people who either have met their out of pocket limit or have not incurred sufficient claims to meet their out of pocket limit. The horizontal split is between people who receive premium tax credits that are keyed to the price of the second Silver and people who are not receiving premium tax credits and thus pay the full premium out of pocket. We will only look at individual beneficiary consequences. The simplest scenario to analyze is a market that has converged with multiple carriers. Indianopolis, Indiana is a good example. There are two carriers that currently offer Silver plans with 68% AV with similarly narrow networks and very similar pricing. The strategic logic of that situation will have both carriers offer Silver plans that would be near 66% AV as soon as they could. Individuals who are receiving subsidies and have significant claims that matched their out of pocket maximum under a 68% AV Silver are indisputably worse off. They will face higher cost sharing. If all cost sharing is from deductibles (an oversimplification), they will go from having a $4,400 deductible to a $4,850 deductible. They do not benefit from lower premiums as the federal government is the risk bearer and reward recipient of lower premiums as the subsidy formula is based on the federal government filling in the gap between the calculated individual contribution as determined by income and the cost of the second least expensive Silver. Individuals who have not met their out of pocket maximum and are subsidized for a 68% Silver will still not meet their out of pocket maximum and their post-subsidy premium will not change. They are indifferent. Individuals who are not subsidized and who meet their out of pocket maximum are almost always worse off. They have a small gain in lower premiums (2% drop in AV leads to a 2.4% premium drop on first estimate) but higher cost sharing. There is a small sliver of individuals whose costs above current cost sharing is less than the premium drop. But this is a sliver of people whose total costs are within $100 of the current out of pocket maximum. The big winners of this change from a beneficiary point of view are individuals who are not subsidized and who are under the out of pocket maximum. They have no incremental cost sharing and they have lower premiums. If the non-subsidized market is extremely price sensitive this will bring in more healthy individuals as prices will fall slightly. This is the simplest scenario. This intuition should serve people well, but things will get complicated.